Twenty-seventeen was a watershed year for Grand Seiko. Not only did Grand Seiko become a brand in its own right last year, but it also released its first mechanical diver’s watch (earlier models were Spring Drive). And Grand Seiko did so with the very best mechanical movement it has to offer – the 36,000 beats per hour, high-frequency 9S-series calibre. In short, the Grand Seiko Hi-Beat diver’s watch combines twin strengths of Seiko, namely high quality and accurate mechanical movements, as well as longstanding expertise in dive watches. The diver is part of Seiko’s bold repositioning of Grand Seiko; former chief executive Shinji Hattori declared that he wants to see Grand Seiko as a globally known luxury brand by 2020. To do that, Grand Seiko must have a definite brand image, something that immediately separates the Grand Seiko watches from everything else that’s Seiko. Such a bold statement in the horological world comes with an equally bold price tag of US$9600. The price places the watch firmly in competition with the other heavyweights in the dive watch pool (no pun intended), including Rolex and Blancpain. So how does the Grand Seiko Hi-Beat Diver’s measure up? Despite not looking like a classic Grand Seiko, you can tell the diver is a Grand Seiko from the moment you set eyes on it. The same design mantra that was set out by Seiko designer Taro Tanaka in the 1960s has been scaled up on the dive watch. Grand Seiko have pulled off something that is not easy: an watch for the extremes that is refined and elegant and still incorporates the purpose for which it was designed. It’s almost a James Bond mandate for a watch, which is what every modern gentleman who’s a weekend adventurer should be wearing. What Grand Seiko labels its “Grammar of Design” shines through – literally – from the angled edges and Zaratsu polished flat surfaces of the case that catch the light. Though the traditional Grand Seiko design elements are prominent, this is definitely a design dynamic for the younger crowd, for those who want a sizable piece of horological real estate, but one that has watchmaking and engineering prowess. Despite the large size of the watch, it wears well on the wrist. The high-grade titanium case provides the size without the mass. 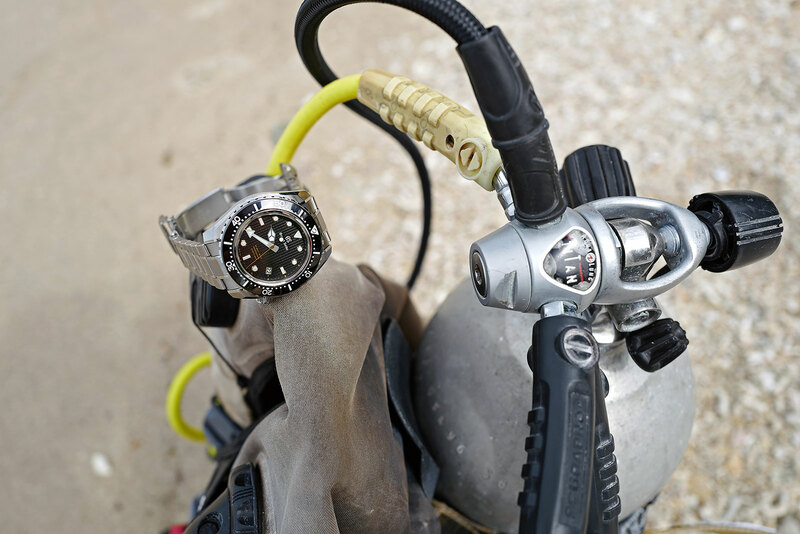 It is way lighter than other dive watches of the same size. 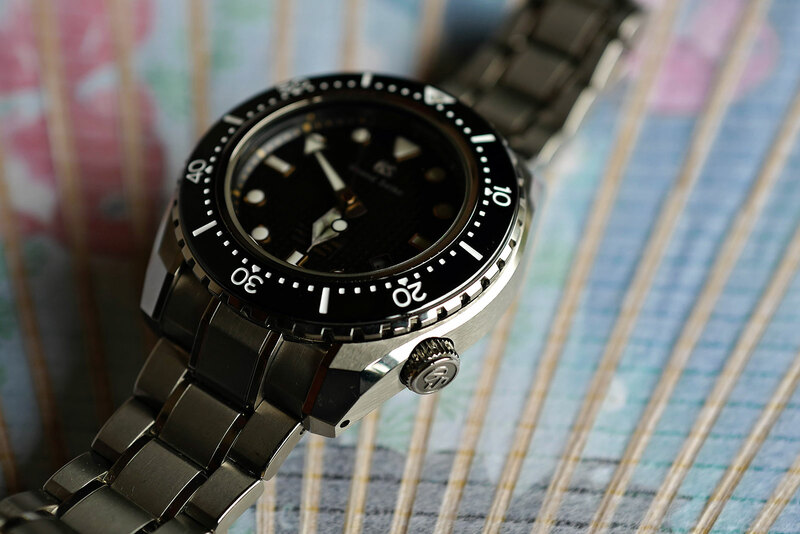 Notwithstanding the quality and the design elements that single the watch out as a Grand Seiko, it still has to perform as a proper diver’s timepiece. 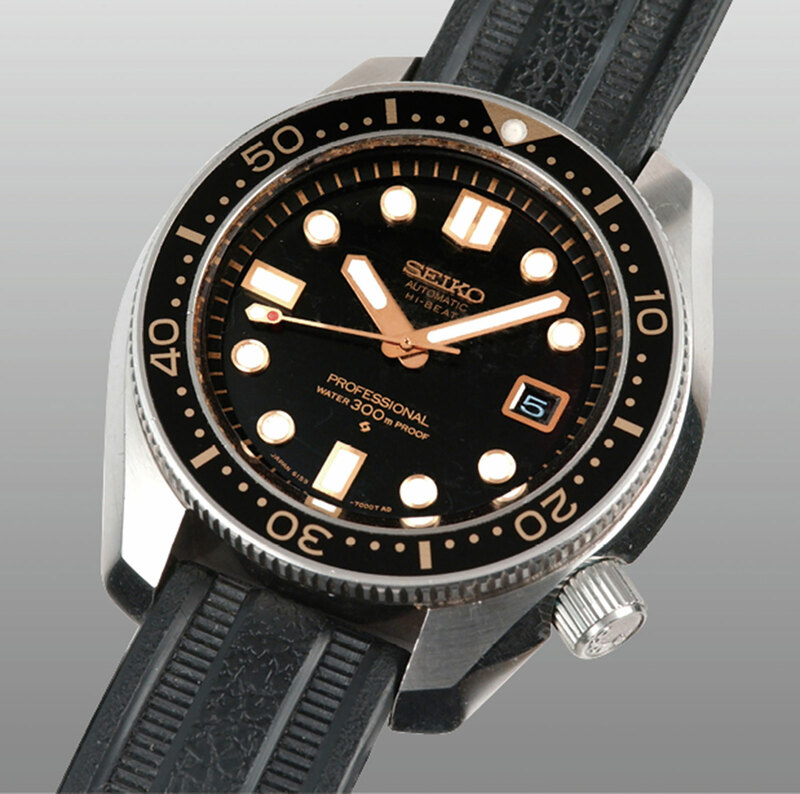 Seiko’s expertise in dive watches goes back a long time, starting with its first diver in 1965. 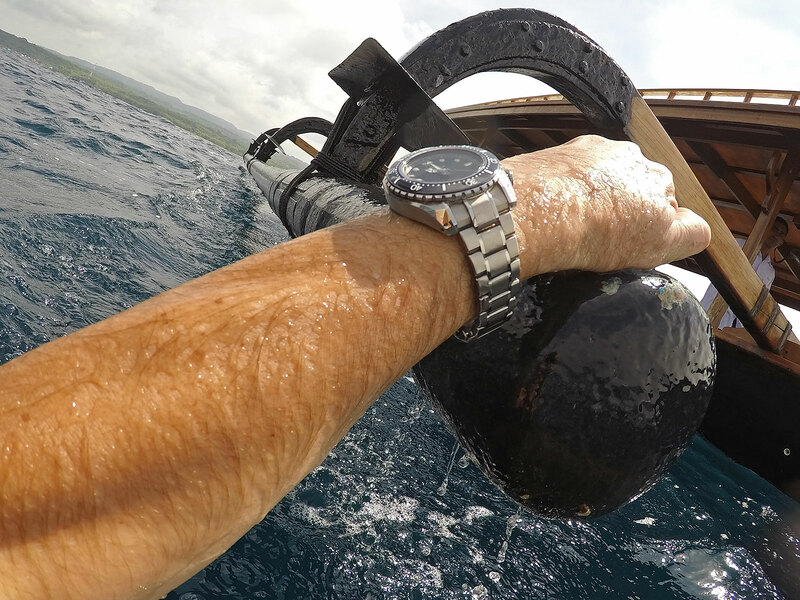 More than a decade had past since the introduction of the modern day dive watch as we know it. During this period, Rolex was developing dive watches for specialist deep sea divers and Blancpain was supplying watches to various military units. On the other side of the world, Seiko was getting its hands dirty with offshore gas and oil exploration in the seas around Japan. As the story goes, in 1968 Seiko received a letter from a professional saturation diver working on an oil and gas rig off the coast of Japan. 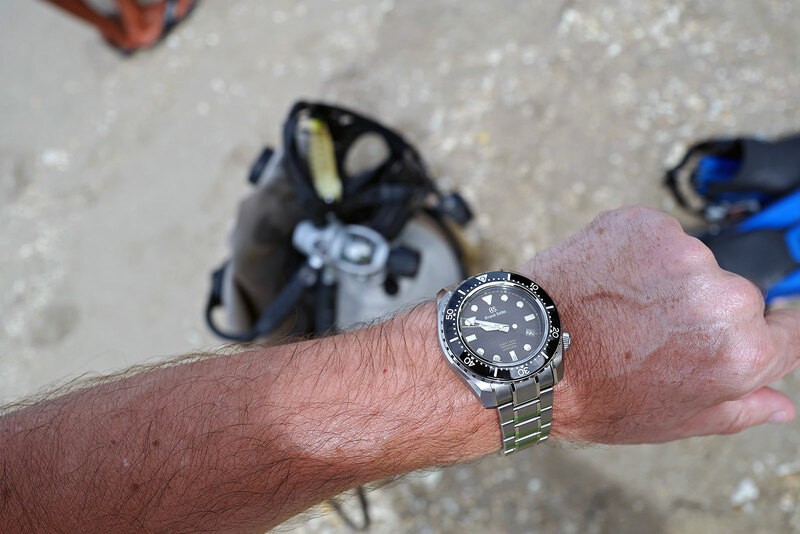 The diver explained that there were no watches, not even so called “diver’s watches”, that could survive the harsh conditions encountered during his dives. While the depth rating was true to the mark, the watches were not sufficiently protected from shocks, and often upon decompression in a hyperbaric chamber, the crystal popped off due to the gas build-up inside the case. With that imputeus Seiko produced a 300m dive watch, the ref. 6215, but it did not sell well. Another attempt swiftly followed with the Hi-Beat diver ref. 6159, almost identical but with a 36,000bph movement. That lasted two years in the catalogue, but after that Seiko stopped production of its dive watches abruptly (though the model was recently reintroduced as a limited edition reissue). 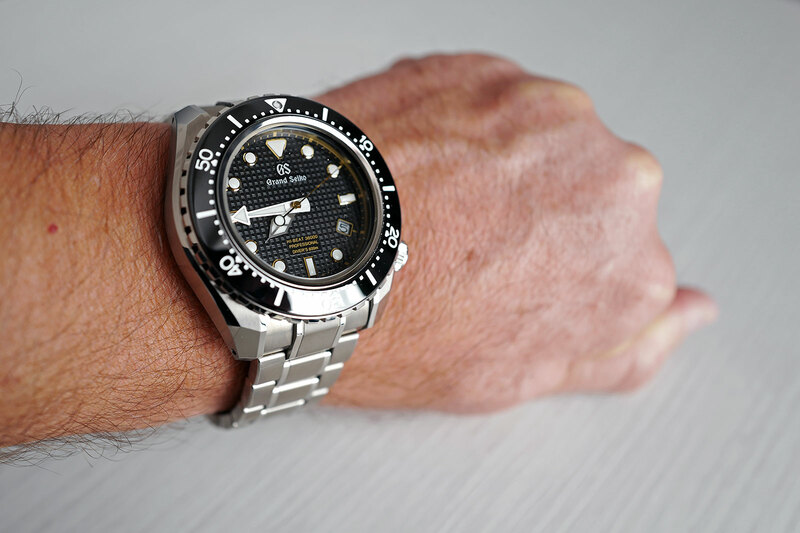 It would be another 7 years before another Seiko dive watch surfaced, as Seiko went back to the drawing board to develop a new and improved diver’s timepiece. A research team led by engineer Ikuo Tokunaga, who’s still active as a consultant for Seiko today, developed the first Seiko “Tuna” dive watch ref. 6159-7010 in 1975. It was with this watch that the label “Professional Specification” was first applied, leading to the modern day abbreviation “Prospex”, which is now the name for Seiko’s collection of sports watches. 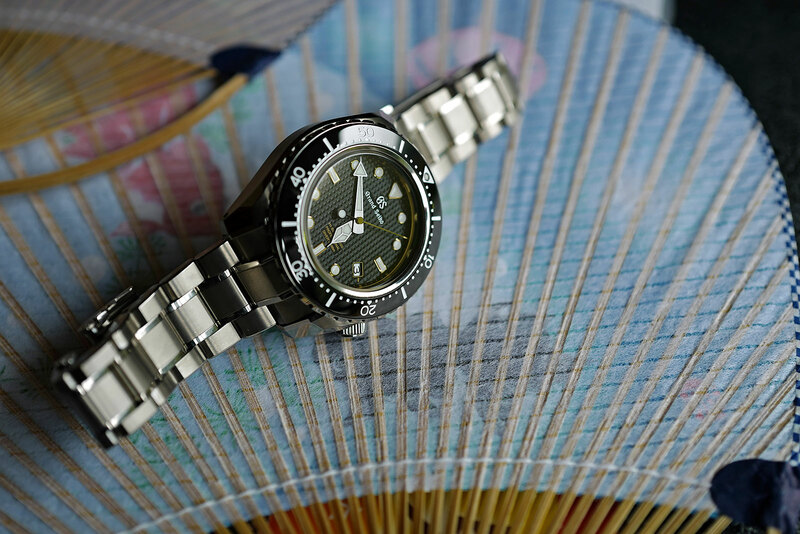 Seiko’s dive watches since the first “Tuna” in the mid 1970s have developed with two distinct differences from dive watches made by other brands. First, the watches have no helium escape valve. Second, the depth ratings do not pass the 1000m mark. There are good reasons for both. Seiko capped the depth rating on their dive watches at 1000m for the very simple reason that humans cannot dive beyond 500m without being inside submersible craft. While a handful of record dives have gone beyond 500m, there is no commercial reason to go beyond, making extreme depth ratings unnecessary. That being said, in 2015 Seiko tested its dive watches by strapping them on the hull of a submarine, with the modern day “Tuna” only stopping at 4299m. And unlike most dive sea dive watches, Seiko’s timepieces have no helium escape valve. The rationale is simple: in the opinion of Seiko’s engineers a release valve creates a weakness in the case, and the watch takes far longer to adjust to decompression with the valve than without it, up to 12 days to fully equalise the pressure inside and out. With a correctly designed case, crystal and gasket, a dive watch will not suffer compression or decompression. 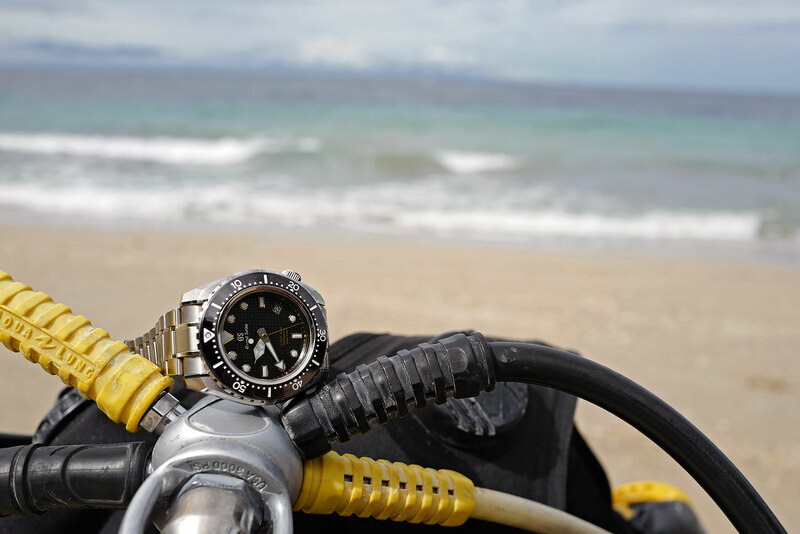 The research led by Mr Tokunaga set out certain technical features, which are used present today, that are imperative for a high-end dive watch. 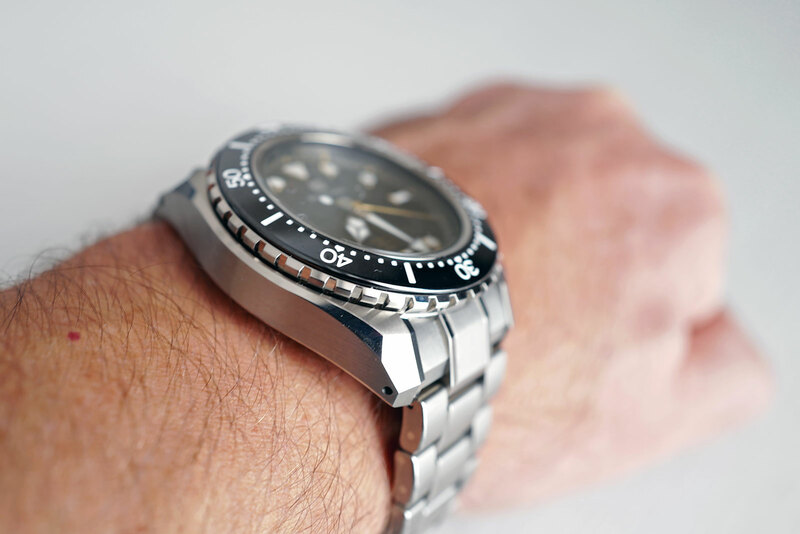 First, titanium and ceramic are the ideal materials for diver’s watches, for lightness and resistance. Second is the special L-shaped gasket that sits underneath the bezel, developed to keep both water and gases out of the case, rendering a helium escape valve redundant. The same gasket system is still utilised in Seiko, and now Grand Seiko, dive watches today. With a case hewn from titanium and rated to 600m, the Grand Seiko divers’ watch relies on the L-shaped gasket to keep out gases. The design of the first mechanical Grand Seiko diver was entrusted to one of the younger designers at Grand Seiko, Shinichiro Kubo. Like his peers, Mr Kubo joined Seiko straight out of design school and has been with the company ever since, 18 years and counting. 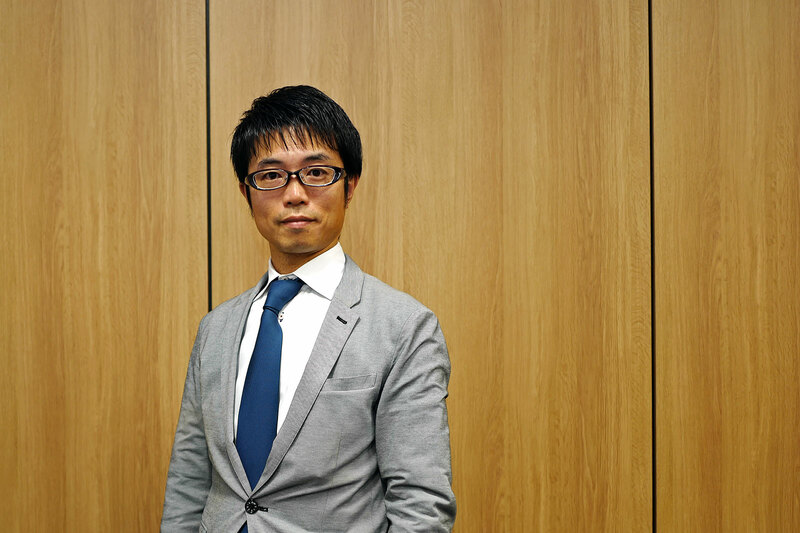 His name is not as well known as others in the Seiko design studios, most notably older colleagues like Taro Tanaka and Nobuhiro Kosugi, who have both won several national prizes. But Mr Kubo has nevertheless been responsible for several important and highly regarded Grand Seiko watches. Mr Kubo’s pen has sculpted the lines of the Grand Seiko models including the SBGA029, SBGX117, SBGA127, SBGH037, and most prominently, the Spring Drive “Snowflake” SBGA011. To pen the Grand Seiko diver, however, Mr Kubo went further. 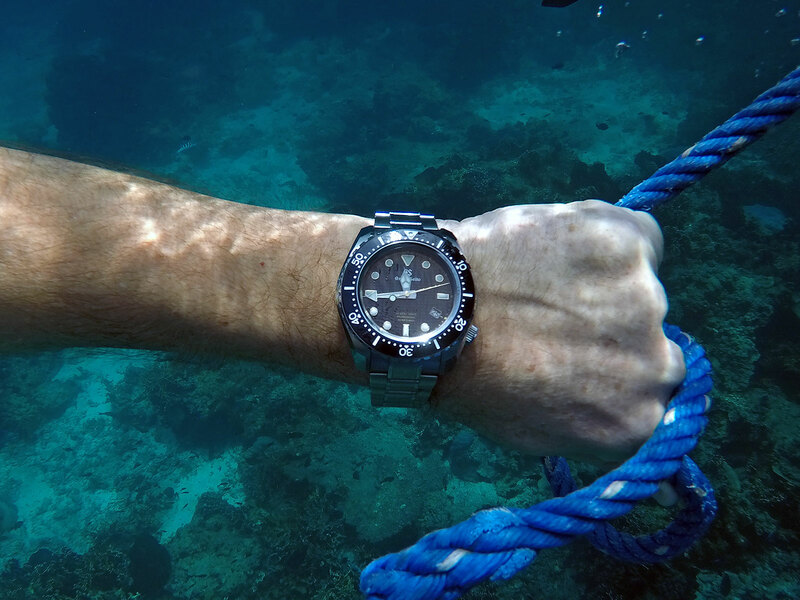 Despite his in-depth knowledge of design and Seiko’s history in the field, Mr Kubo went to experience diving for himself. When I asked how his aquatic endeavour influenced the design of the watch, Mr Kubo recalled two salient features of his first dive. The first was the bubbles underwater, an immersion in a blanket of dancing orbs – which are not strictly spherical. This led to the dial motif: rounded squares that are irregular but arranged in a uniform pattern. The second memory the increasing absence of light the deeper the dived. With the diminishing light legibility becomes more difficult. That led to a streaming of the dial, as well as big hands and indices. The inspiration for the watch case came from the 44GS, a vintage Grand Seiko from 1967 with distinctive wide case flanks. 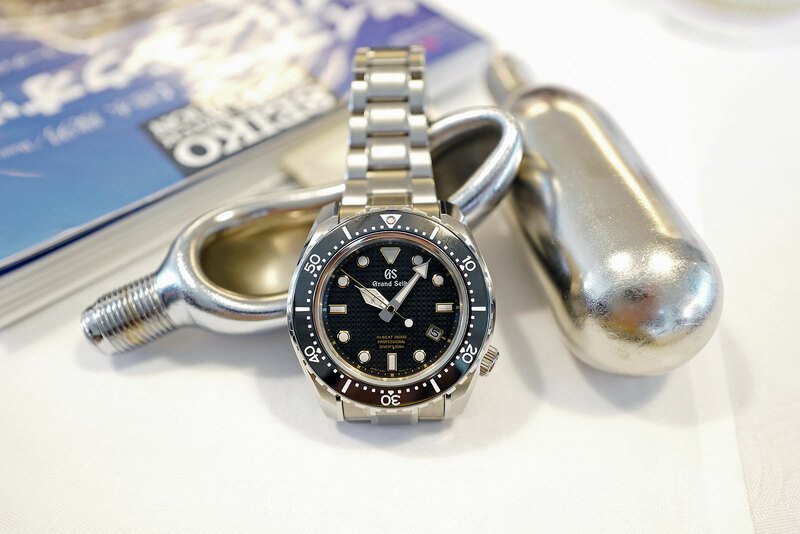 The original 44GS design was enlarged for the Grand Seiko diver. The diver is to the 44GS what Iron Man’s Hulkbuster is to his usual armoured suit – the same aesthetics and overall form, but beefed up with enhanced capabilities for extreme environments. 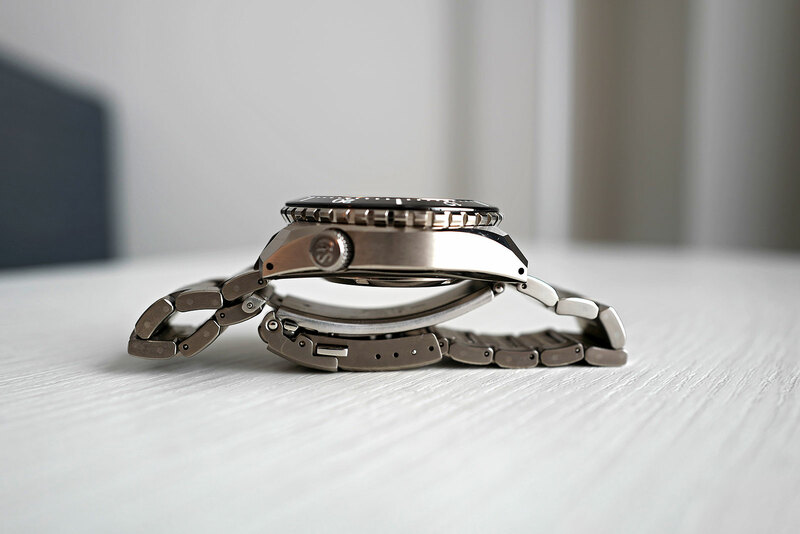 While Seiko’s research already established the superiority of titanium over steel as a case metal, the lighter alloy brings with it problems peculiar to a Grand Seiko case, not least of which being the polishing of the surfaces. 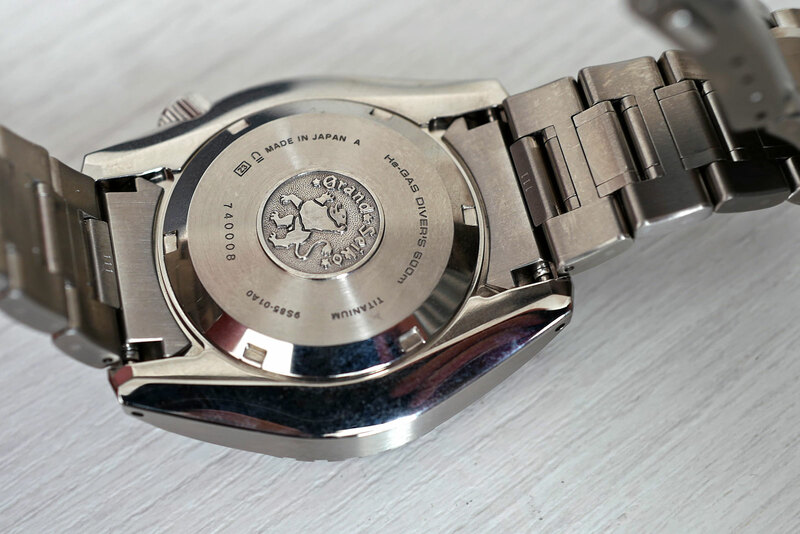 The case of the Grand Seiko dive watch is an exhibition of the brand’s art of Zaratsu polishing, a technique of mirror finishing that creates extremely flat surfaces. There are 24 different surfaces on the case, all set at different angles, which require polishing to either a faultless mirror surface, or a brushed surface – with the brushing being applied after a Zaratsu polishing. The number of flat surfaces serve to enhance the reflective shine of the watch case, a key quality of Grand Seiko cases. Mr Kubo also pointed out that using polished flat surfaces is actually more visually effective than a polished, rounded surface as light reflecting off the flat surface reflects the whole surface. A round surface will only effectively reflect a line of light, which is why the use of the flat surfaces enhances the eye catching aspect of the case. Beneath the waves the Grand Seiko diver truly does come into its own. Admittedly when testing out the watch I did not push the envelope on the 600m depth rating. In fact, I did not even get to ten percent of the depth rating. But I was able to try out the watch while diving in the coral reefs off Moyo Island in Indonesia. On dry land the watch is sizeable, with a case diameter at 46.9mm and a case height of 17mm. Despite this, the fact that it is titanium helps to keep it wearable. You do notice the watch on the wrist – the thickness of the case is such that the watch still has heft – but it is not uncomfortable. That the underside of the case is sculpted and polished to fit the wrist adds to its ergonomics. It size and highly finished surfaces means the watch was noticed – both by the wearer and by others. The polished surfaces really do catch the eye. Under the water the watch does what Mr Kubo required it to do. All elements of the watch that are obvious above the surface are no longer a consideration: you only left with a clear and legible reading of the time. Aside from the time, all other elements like the date and dial motif diminish with the fading of the light as the dive deepens. Timing the dive is simplicity itself. Back on land the seawater is easily washed off and the watch returns to the highly polished finish. 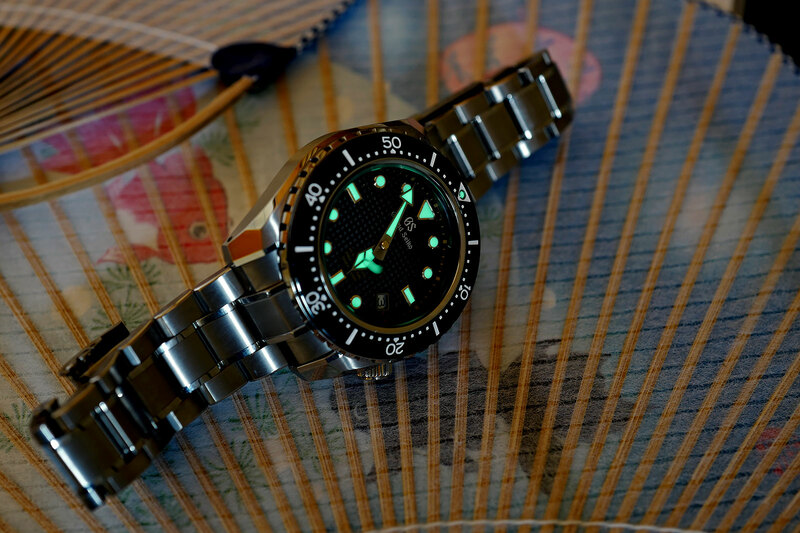 The Grand Seiko diver is both an admirable watch, as well as a professional dive instrument. On that score it comes up against the formidable Rolex Sea-Dweller Deepsea. As luxury professional dive watches go the Rolex Deepsea is more of tool watch and not really conveniently worn every day, but still manages to look as refined as a high-end watch rated to 1000m can be. In terms of polish, the case work of the Grand Seiko is easily the match for the Blancpain Fifty Fathoms and adds into the equation a greater depth rating. The Fifty Fathoms and Deepsea are arguably interpretations of watches that were developed over a half a century ago, while the Grand Seiko is a modern dive watch that draws on the firm’s knowledge and past research. Corrections June 7, 2018: Corrected years for introduction of various Seiko dive watches and the first Seiko diver ref. 6215 was not high beat, as previously written.